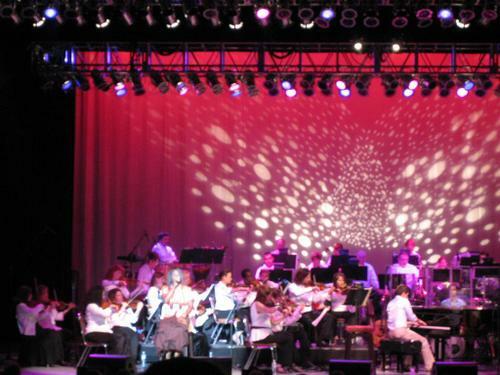 Part concert, part comedy show, Clay Aiken and a live orchestra performed in front of a few thousand of his most dedicated fans on Saturday night. Before the show, I had spoken with fans of the American Idol runner up, or Claymaniacs, who told me that an Aiken concert is as much about his interaction with the audience as it is about his trademark big vocals. I was a little skeptical about how this would turn out because I appreciate rapid fire performances in live concerts. However, many an Aiken concert veteran assured me that I was in for a great night on this stop of The Soft Rock & A Hard Place Tour. Thankfully, Aiken delivered. 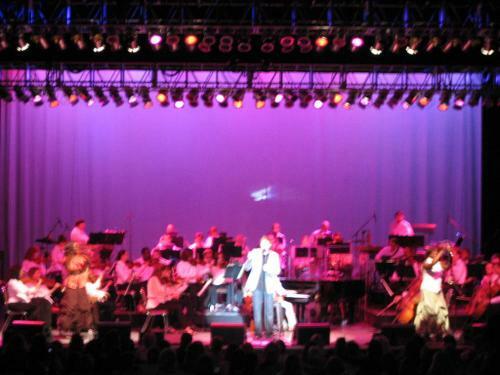 In an entertaining two hour set, Aiken and his background vocalists Angela Fisher and Quiana Parler put together an upbeat night (somehow, in a set filled with ballads) that was just as filled with laughter (legitimate “LOL,” “LMAO,” “ROFL” laughter) from the audience as it was with strong performances coming from the performers on stage. As is inevitably the case with many a stop on the Mobile Beat tour (big ups to the Mobile Beat bloggers who have encountered some unexpected surprises in this past week), not everything went according to plan pre-show. By the time I made it to the venue, I was convinced that there was no way that I was going to pay $15 to park in the general stack parking area (which took 2 hours for me to break free after The Fray concert earlier this summer). Last time, the marketing director of the company who put on The Fray concert helped me out tremendously, literally dragging me from “the pit” and into the photo area so that I could get clear shots of the stage. Before the show, she told me that I should have parked in the press area. Already facing past due payments on my car and student loans because of this summer’s concert tickets (who cares about my FICO score… other than my future wife, who I hope is reading this), I took a calculated risk and passed on the regular parking area and headed straight towards the non-stack parked VIP lot to work my munchkin-like charms. I’ll admit that I name dropped. It was shameless. The parking attendant thought about it for a second, then handed me a parking pass and told me to make my way into the parking area designated for performers, literally saving me two hours. With absolutely nothing that said I should actually be there, I was in. Hollerrrr. After claiming my seat ticket at Will Call, I discovered that my photo pass was missing and that I wasn’t on the list. Determined to get this photo pass, I scoured the grounds like a raccoon looking for a tasty looking garbage buffet. Amazingly, I spotted Vanessa (who resembled an angel sent from above by this point, or Waldo in a frustrating game of “Where’s Waldo?”), who had provided me with my photo pass previously, and I ran after her like a crazed paparazzi. After a brief explanation of the missing pass situation and reminder that we had met previously, Vanessa hooked me up with a photo pass. Now, I was really in. The second I walked into the venue, I knew this was going to be a concert unlike any other. After hanging out with teenage girls (again, holler!) last week at Carrie Underwood’s show, I expected a similar crowd for another American Idol alumnus. Instead, it was a much older crowd than I expected (median age 45? ), skewed about 90% female. The stage was set up for a full orchestra, something I wasn’t expecting, but was pleasantly surprised to find. As one of the few non-balding males in attendance (not that there’s anything wrong with balding), I was an anomaly at the show. I found two girls with a “Clay took our concert virginity” poster, which was more of what I was expecting from the night’s audience. Seeing them and their sign made me feel more at ease because I was a Clay concert-virgin that night and they seemed pretty happy with their first experience. I suppose it says something when people come back for more after that first intimate experience…instead of not returning your text messages… nor calling back… perhaps blocking on IM…maybe even Google chat… Wait, what are we talking about? Opening up the show with “Here You Come Again,” Aiken brought everyone seated in the pit to their collective feet (after they told me that they were going to stay seated as I kneeled in front of them to snap pictures). Despite the fact that this pit was no where near the pushing and fighting for position that I’ve become accustomed to, the energy and enthusiasm in the pit was impressive. Immediately, I noticed how respectful the Clay fans were and how they attend concerts for the purpose of listening, not to sing along loudly like at a rock concert (see me at The Fray), nor hurl expletives at the stage like a hip-hop concert (see me at any hip hop concert). On a side note, that would really hurt my feelings if I was a rapper, which is clearly the only reason why I haven’t yet been signed by G-Unit, as my lyrical skills is no doubt “fly” and “on point,” naw mean? No? Me neither. Next up was “Everything I have,” which is my favorite Clay song off his second CD. If you’re a ballad lover who enjoys curling up on your couch with some hot chocolate, a self-heating face mask, a towel wrapped around your head while you use a deep conditioning treatment, while you get emo to whatever music is playing as you watch a simulated fireplace on your screensaver (because real fire is SO 90’s. Ew.) like I do (this is half true…which makes me self-conscious), this might be one of the better ballads that many have never heard. 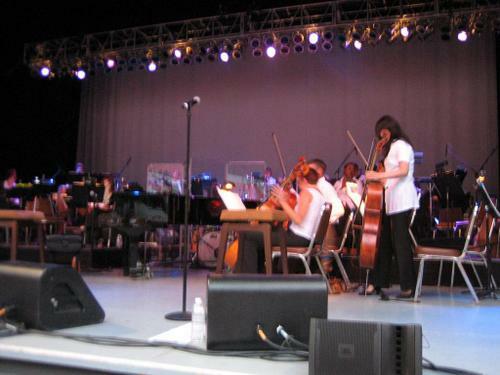 After the two ballads, Clay performed “I Want To Know What Love Is,” which heavily featured Angela Fisher’s vocals as well. At the end of the song, Aiken and Fisher had an on-stage battle performing runs, which was a lot of fun for both everyone in attendance as the runs were overdone to the point that they were as hilarious as they were impressive. Clay asked the audience if it was hot outside because he was overheating on stage. Immediately, women started exclaiming, “TAKE IT OFF, CLAY!! !” With the reflexes of a paranoid schizophrenic cat supped up on adderal, I ran into the aisle ready to snap pictures (in the name of the Mobile Beat, of course), only to return blushing and disappointed to my seat. What makes Clay’s show so entertaining is that he, Angela, and Quiana are such engaging personalities who are so comfortable on stage that you can’t help but get drawn in as they joke around with each other and the audience. Clay’s humor is self-deprecating and honestly, much funnier than I would have ever expected. He joked that the few men in the audience there with their wives were probably getting drunk before the show, thinking “This is the only way I’m going to get through this… this, and Barry Manilow…” I can’t make some of this stuff up. “When I See You Smile” was truly heightened by the live orchestra that paired perfectly with Clay’s clear, powerful, and almost effortless sounding vocals. 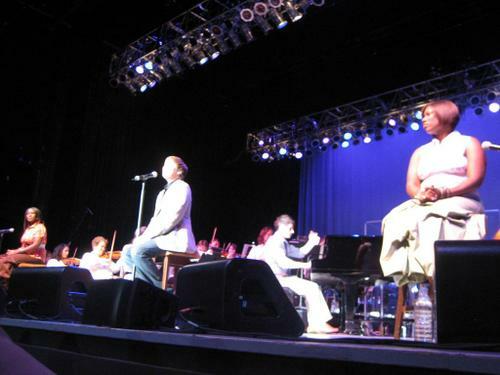 “Every Time You Go Away” featured Angela and Quiana on some great harmonies during the chorus that would have been a welcome addition to Aiken’s studio version of the song, which the crowd appeared to agree with as it jumped to its feet to applaud the pitch perfect performance. A first for me, but apparently a mainstay of this year’s Aiken tour, was the TV Show Theme Songs Medley. Clay revealed that he sang the theme to “Perfect Strangers” (big ups to Balki and Cousin Larry) for his American Idol audition before the judges asked him to sing another song. Singing songs from TV shows that spanned about three decades, Aiken and his backup vocalists performed theme songs from not only Perfect Strangers, but Full House, Laverne and Shirley, Diff’rent Strokes, Charles in Charge (which Quiana performed so well like it was ready to be released as a radio single), The Jeffersons, and other well-known TV shows. The unusual and pretty wild medley that saw Aiken take off his jacket and dance around the stage for brief stints, got a rousing standing ovation from the appreciative crowd that enjoyed the trip back in time. Bringing the audience back to their seats, “Open Arms” brought the audience back to their seats to take in Aiken’s vocals as he and Angela put together some pretty incredible harmonies. It was an interesting experience to be part of such an engaged audience, to the point where a woman sitting next to me took a cell phone call during a song and received some of the dirtiest looks I have ever seen in my whole life (my look being the most fierce, “Blue Steel,” baby) from what was probably one of the nicest audiences I’ve ever been a part of. 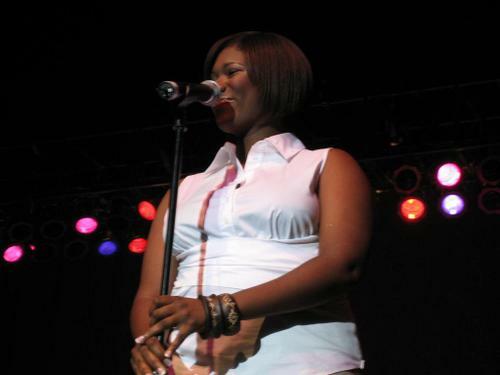 Next, Aiken gave the stage over to backup singer Quiana Parler. She performed Faith Hill’s “When The Lights Go Down,” which featured some powerful runs and some Whitney-like flashes of vocal brilliance. It was refreshing to see an artist give his background vocalists so much credit, as Clay did at numerous points in the night. It was well deserved because as Clay put it, Quiana “blew the crap out of that song.” If my body could produce such sounds every time I blew the crap out of something, let’s just say that I would never make it off the can in the morning. After a brief intermission and orchestra tune up (what a trip to see this at a non-classical concert! ), Clay and Co. returned to the stage to thunderous applause to perform “Right Here Waiting.” Even as large moths and large airborne bugs attacked Aiken, Fisher, and Parler during the performance like crazed women ripping at my clothes every time I walk into a room (I’m completely joking), the trio pulled off an impressive vocal performance that featured some of the longest notes I have ever heard in my whole life by Aiken. “Sorry Seems To Be The Hardest Word” was one of my favorite performances, as it featured more of Aiken’s vulnerability in his voice, instead of his trademark huge vocals. Following these two ballads, Clay performed “Measure of a Man,” the title track off his first album to huge applause. Even if you’re a Clay-hater (and I know they’re out there), the piano, orchestra, and Clay’s huge vocals on the chorus made this a performance that would be difficult for anyone not to smile at. It was one of the most electric performances on the night and it made me wish that Aiken performed more songs off his first CD like “Solitaire,” “Invisible,” and “This is the Night,” but it wasn’t meant to be. Before performing “Without You,” Clay joked with the audience about topics ranging from laxatives to the fact the he performs a ton of slow songs and how he didn’t want to bore the audience with ballad-palooza (I made that up, not Clay. He’s wittier). The harmonies on the song’s huge chorus were spot on and I think the superb performance of the track brought many in the audience back to the version by Harry Nilsson that brought the song to legendary status in the 1970’s. For me, it brought me back to the version by Mariah Carey, but there were numerous generations in attendance that were could appreciate the song in different ways. Afterwards, Clay sympathized with the males in the audience, apologizing for all the slow songs, but guaranteeing that “Your wife will be very happy when she gets home,” before performing Michael Jackson’s “The Way You Make Me Feel” as he weaved in and out of the audience. Nearly stealing the show, singer Angela Fisher performed “Listen,” made famous by Beyonce’s performance in the movie Dreamgirls (yes, I saw it, girlfriend). I was really excited for this performance after hearing about it from some Clay veterans earlier in the night. Angela tackled every note with all the passions of a Beyonce’ and Jamie Foxx argument on the big screen and worked the crowd into as much of a frenzy as you can possibly do with a ballad. People cheered audibly during each of the choruses and Angela’s stage presence was an absolute joy to behold. She received what could have been the most well-deserved standing ovation of the night. Next up, Clay did by performed “Lover All Alone,” a song he co-wrote with David Foster. The result is a really passionate ballad that featured an incredible cello solo to go along with Clay’s vocals and a simple piano melody. 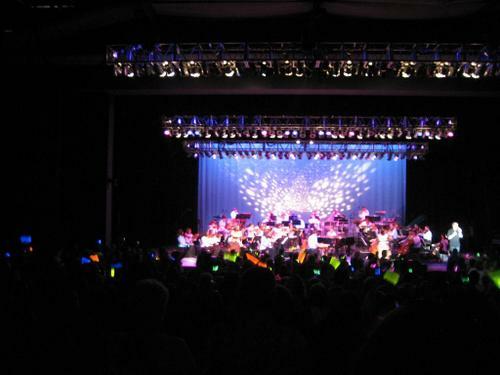 Clay finished out the show to a crowd waving glow sticks side to side during his performance of “Because You Loved Me.” Before performing the song for an audience that wanted more, Aiken joked that half the crowd would be at the next show anyways, which resulted in a lot of laughter. After meeting so many Aiken followers that night, I am positive that Clay was being completely truthful in that statement because his fan base really is that dedicated. 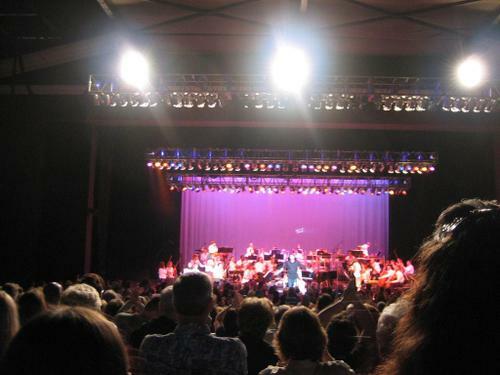 In what was probably the most relaxing concert I’ve ever attended with the most respectful crowd I’ve ever been a part of (I am positive not a single expletive was spoken all night), Clay Aiken put on a great show vocally and in terms of entertainment for the audience in attendance. Not only is Aiken a powerful vocalist who has developed his own identity and following that has gone well past him being a “guy from American Idol,” but he puts on a hilarious show that is filled with more laughs that you’d ever expect from a ballad-filled evening. While I wish that Aiken performed some more songs from his first CD, few Aiken fans would ever leave his show unsatisfied, as the singer manages to make everyone feel like they’re just hanging out with Clay and his band for the night. With strong vocals throughout the night and random banter that surprisingly did not annoy me between songs (almost an impossible task), Aiken became more than just a singer to me tonight, but lived up to his reputation as a strong entertainer as well. Great review Dave, glad you enjoyed the concert!!!! Clay is a performer like no other I have seen. The joy he gives so effortlessly, and that amazing voice, keep us coming back for more!!! Hello Dave, You did Clay proud, as well as his fans. Thank you for being open minded in writing your review--Most important I am so very happy you enjoyed the concert. Great review! Makes me want to go to multiple shows myself. Thanks! I loved your pictures, especially the one of you. You really gave us the whole experience. I felt like I was there. 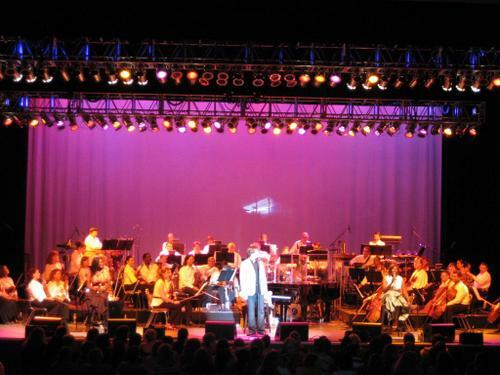 Great review, Dave, glad you enjoyed one of my favorite artists' concerts! By the way *g* I definitely understand why you don't usually have a photo ID! You need some help there, dude...at the next concert, get someone from the Claynation (NOT Claymaniacs) to show you how it's done. In the meantime, check out any of the Claynation fansites (there are many) for some wonderful pictures from all the concerts in this tour. You rock! Thanks for the smile. how refreshing to have a reviewer that takes time to look at the show and does not have an inside agenda. 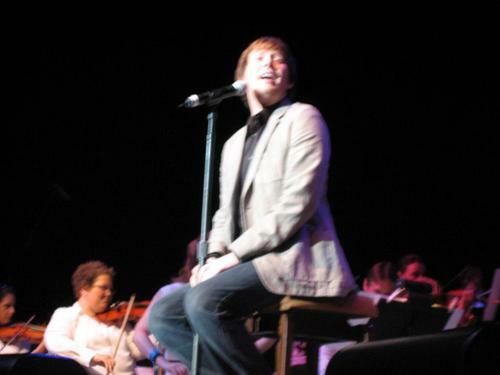 clay aiken sure is an entertainer as well as a great singer. You're a great writer and not just saying that because you enjoyed the concert. Your personality shows in your review and sounds like you'd be a lot of fun to hang with. I agree with some of your critiques-Clay's got to get some better material but I love that he can take what he's given and make it work. It'll be interesting to see how he progresses with this next CD. I think the guy's really talented. Just hope for some originality next CD. Thanks for your in-depth review of Clay's concert.I think it's the longest review I ever read. Great job. I am so glad that you enjoyed Clay's concert. There is just no one like him. I have to thank you for putting the time and energy into doing an honest review of your concert experience. Loved your pics too. Great review! I saw the show in Philly earlier this summer with my teenage daughter and husband. We all enjoyed it very much. Clay is a wonderful entertainer along with being a great singer. I'm glad you enjoyed the concert and I enjoyed reading your detailed review! Very well written! I'm glad you were able to meet Sarah too. Thanks for sharing your review with us! Great job!! Excellent concert review, Dave. Thank you for the well written and enjoyable read. Clay is indeed a great singer and entertainer. You're right. Clay is a great entertainer as well as a fabulous vocalist. He's funnier than most comedians and so much more genuine. I love that he takes risks and becomes better every time he's on stage. WOW! What a fantastic review!! Thank you so much. To hear someone such as yourself, who is not a diehard Clay fan, give such a great review is just wonderful! I honestly think this is the best review I've ever read. Again, thanks! Hey, Dave, thanks for the long review. It's worth reading it, not because it's about Clay Aiken. Well, yes, it's about him mainly, but you were honest and really unbiased. Never a dull moment in any of his concerts. He is dynamic, isn't he? That is why his fans keep coming back. And did you know that attendees of his concerts range from 5 year olds to 95 and maybe beyond? Loved the detailed review, Dave. It's great that you stayed for the whole show and, as with most newbies to Clay's shows, you came away really giving him his props. He is a brilliant entertainer who happens to have an unbelievable voice!Quiana and Angela are amazing talents in their own right and the three of them together are a delight. I think you could definitely be a Clay Dawg in the making! enjoyed your review and makes me want to go see Clay myself in concert. I love his voice. Glad to see that you went in with a total open mind and saw what we all see. Wish there were more like you that can appreciate "Clay, The Talented Performer", because that's exactly what he is. Thank You for a great review! Great review of a great show, Dave! I saw Clay in NH a few weeks ago and couldn't agree more with your review of the show. He is a great vocalist and entertainer. We laughed as much as we cheered, and the guy I brought with me was totally "Clayverted"! It's clear you go to many concerts with very different musicians. Thank you for doing what a reviewer should do....stay for the entire show and give an honest opinion of the talent. Thanks again, loved reading your review! What a great review!, you are a very good writer, so detailed, I enjoyed like I was there!... thanks. Dave - What an enjoyable review! First, and foremost, I'm glad that you enjoyed the show.I am even more pleased that you recognized that Clay is an entertainer who interacts with the audience with his voice and his humor. I love the way you described the evening, starting with your personal journey for a place to park and including a description of Clay's fans. 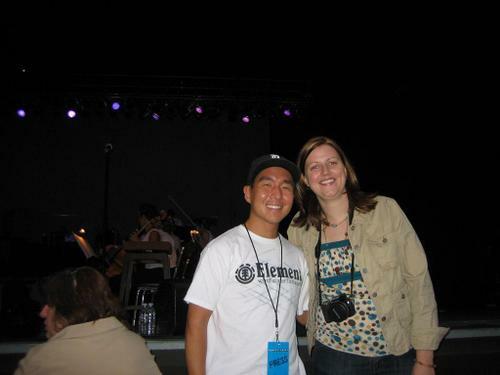 Cute picture of you and Sarah Logghe. She will be joining me and other enthusiastic fans as we Clay-trek to North Carolina and Tennessee! Dave, this was fun. Don't be a stranger at Claymaniacs! As Clay continues the journey in his career, your observation and opinion will always be welcome. Wow, great review and long! It's nice to see a reviewer who went to the concert, obviously watched the entire concert, and then hoestly reviewed the concert. No baggage, no extras! It was wonderful. Nice that you liked the Clay fans too. It's a very enthusiastic and varied group of people -- all ages, all types and all pretty nice! I saw the show in Tulsa and loved it. Sounds like it has gotten even better (that happens with Clay's tours) as it has progressed. Again, thanks for the great review. I loved reading it. Dave -- I give you props for remaining for the entire show and giving an unbiased review. I love your detailed account of the show. Clay is one talented singer and entertainer and surrounds himself with very talented people to whom he constantly gives his own props. Glay you enjoyed the show. Good luck with future endeavors. Thanks for such a detailed concert review. I haven't been to one of Clay's concerts this summer, but I'm going online to see if I can get tickets for the Cary concert. It sounds like alot of fun.